At Airkenya safety and security are of paramount importance. As one of Africas leading aviation companies Airkenya aspires to reach new heights of service delivery. At Airkenya our diverse operations are looked into with eagle eyes. Our aircraft are thoroughly inspected by highly trained engineers to ensure our passengers enjoy consistently smooth safe flights. Our excellent maintenance facilities have been approved by the Kenya Civil Aviation Authority, the Tanzania Civil Aviation Authority and the Uganda Civil Aviation Authority in accordance with international airworthiness safety standards. This together with our dedicated ground team has secured Airkenya an impressive track record for safety. All aircraft passengers and third parties are insured by Marsh Aviation Insurance. Flights from our exclusive passenger terminal are easy comfortable and convenient. Airkenya and the Kenya Airports Authority provide all the required security checks and passengers flying with Airkenya can enjoy Kenyas finest coffee in the Dormans Coffee Shop or choose to peruse the souvenir shop in a friendly secure atmosphere. Kenya's capital city is the regional hub of Africa. From the wildlife to the nightlife Nairobi is a city unlike any other. Multi racial and multi cultural are all facets of this unique city of contrast. Discover the wonders of the Nairobi National Park and enjoy superb international hotels. City excursions from shopping to culinary Nairobi offers a unique mix. Visit the Bomas of Kenya and learn about the 42 tribes of Kenya or venture further to Karen Blixens Kenyan home and Museum or sample the delights of the myriad restaurants on offer. Explore Kenya's rich history at the Nairobi National Museum dine at Nairobi finest restaurants. Nairobi is a capital city on the move. Even for the business travellers convenience internet access banking courier services transport and telecommunications are readily available across the city. From its hub at Wilson Airport Airkenya operates both scheduled and charter flights across the region. Airkenya flies into Kenyas best known game reserves namely the Masai Mara, Amboseli, Nanyuki, Meru, Samburu, Loisaba and Lewa Downs. Airkenya has subsidiary airlines in Uganda, AeroLink Uganda and Regional Air Tanzania, who both fly the tourist circuit in Uganda and Tanzania respectively. Airkenya will effective 1st June 2019 operate a Maasai Mara - Entebbe flight via Kisumu. The Maasai Mara to Serengeti service continues with a boost as Airkenya takes over teh road transfers to ensure a smooth road transfers via the border towns of Isebania and Tarime. The scheduled daily flight to Kilimanjaro in Tanzania continues with Regional Air Services offering a convenient connectivity into the Northern Serengeti Manyara Arusha. 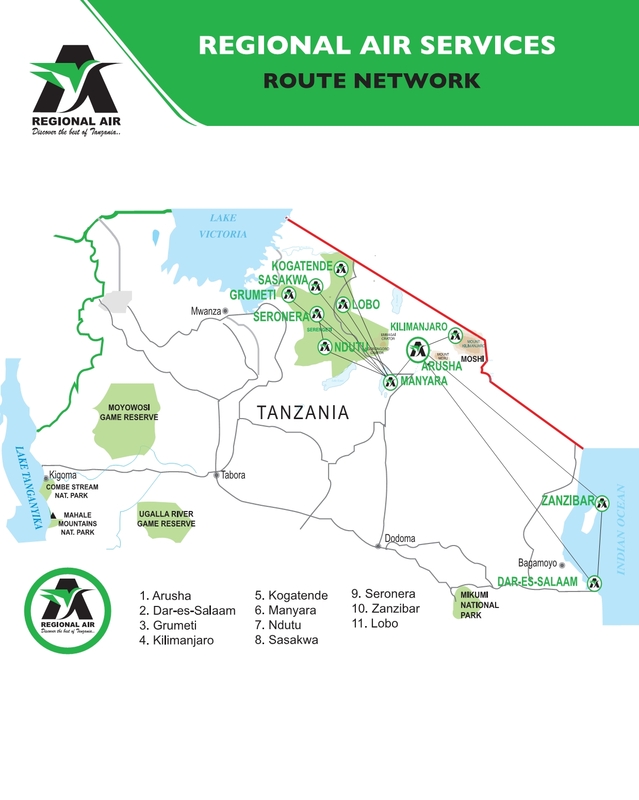 Check out www.regionaltanzania.com for more information. Regional Air Services (RAS) has long been synonymous with the very best scheduled and charter services in Tanzania. Based in Arusha, RAS offers a seamless service from the Serengeti to an Arab feast that is Zanzibar. The airline operates a fleet of single and twin engine aircraft, 16 years of experience moving groups and Individuals through Africa’s tallest mountain, Kilimanjaro, RAS can also fly you into Kenya with its sister airline Airkenya who flies internally within Kenya into all the major game parks and coastal towns. Regional Air schedules routes include: Manyara, Grumeti, Seronera, Sasakwa, Kleins Camp, Lobo, Kogatende, Ndutu,Kilimanjaro,Dar-es-saalam and Zanzibar. AeroLink Uganda Limited a subsidiary of Airkenya Express Limited in Kenya is a domestic airline offering both schedule and charter flights into Uganda's national parks. 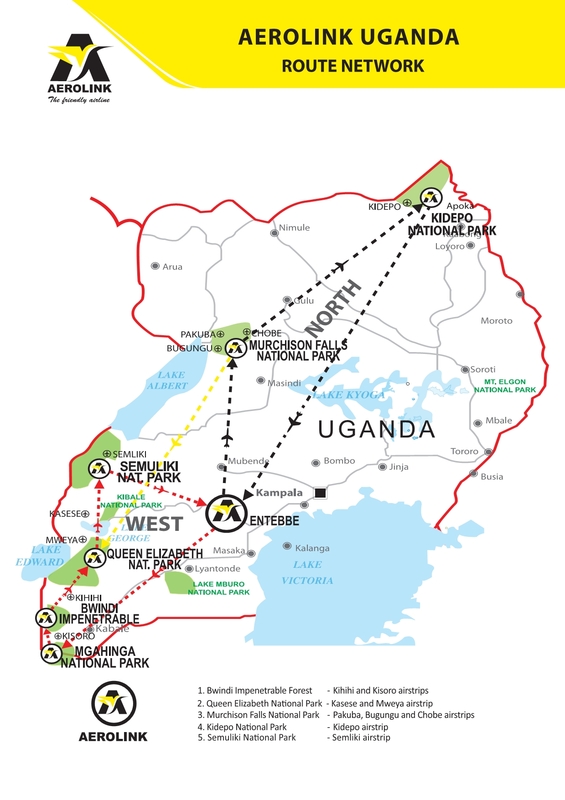 From its base at Entebbe International Airport, AeroLink offers daily flights into Bwindi Impenetrable Forest (Kihihi and Kisoro airstrips), Queen Elizabeth National Park (Kasese and Mweya airstrips), Semuliki National Park (Semliki airstrip), Murchison Falls (Bugungu, Pakuba and Chobe airstrips) and Kidepo Valley National Park (Lomej airstrip). AeroLink provides a convenient and affordable link to the National parks. At AeroLink, flight and ground safety are an integral part of the operation and it is AeroLink’s policy that all employees participate in and adhere to the Flight Safety Program. Simulator training for the pilots is undertaken in conjunction with Flight Safety in Toronto Canada. To ensure smooth flights our highly experienced engineers thoroughly inspect and maintain every airplane in accordance with international airworthiness safety standards at our excellent maintenance facility which is approved by the Kenya Civil Aviation Authority. the Tanzania Civil Aviation Authority and the Uganda Civil Aviation Authority.